Ischyropsalidinae is a monotypic and morphologically distinct West Palearctic subfamily restricted to Central Europe and the Iberian Peninsula (see here for an interactive distribution map). Centers of endemism are the Alps, the Cantabrian Mountains and the Pyrenees. 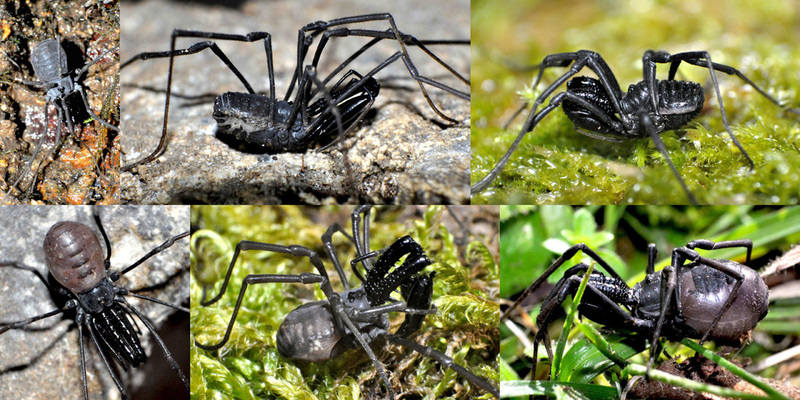 The about twenty Ischyropsalis species are large in body size and unmistakable within the European fauna for their peculiar and enlarged chelicerae. Males of several species have glandular fields on the basal segment of the chelicerae, used for nuptual feeding during mating. The size, position and form of the glandular fields, often associated with special apophyses, are, together with genital morphology, species specific and serve as main characters for species delineation and identification (Martens 1969). Animals are generally blackish in coloration. Different systematic concepts are available within the genus based on morphological peculiarities of male palps, chelicerae and genital morphology. A molecular genetic analysis is necessary to validate the different characters and concepts. Ischyropsalis was thoroughly revised by Martens (1969, 1970, 1978) who reduced the number of species from 50 to about 20. Although animals have traditionally received a great deal of taxonomic attention for being large, rare and conspicuous, a number of micro-endemic species from caves in the Cantabrian Mountains and cryptic species in Italy still need to be attended to. Ischyropsalis favors cold habitats in combination with high humidity and many species are restricted to higher altitudes or enter caves, and a high percentage of troglobionts is present. Ischyropsalis hellwigii is specialized in feeding on snails whose shells are opened with the massive chelicerae. Other species do not show this preference but prey on a variety of arthropods (Martens 1975).